How to prepare your body for an easy labor - 7 practical tips! Today I’ll be sharing with you 7 easy things you need to do to prepare your body for an easy labor. Did you know that prepping your body for labor can dramatically decrease the time you spend laboring and pushing, as well as the time you spend recovering? As a first-time mama pregnant with my daughter, I didn’t think much about preparing my body for labor. I thought I was set! I drank a couple of cups of red raspberry leaf tea (RRLT) a day, and I bounced on my exercise ball a couple of hours every day. By the way, you can get these 2 essentials delivered to your doorstep today with Amazon Prime. By using my link, you’ll get a 30 day trial for Amazon Prime for FREE! My labor did end up going smoothly and I birth my 7lbs 14oz daughter without an epi just like I had wanted, but I suffered from excruciating pelvic pain for many many months after she was born. I also remember my body feeling very sore during the first 1-2 days after she was born. Looking back, I know that I also could’ve done a lot more to prepare my body for labor. Having my son last year really opened my eyes to see what I hadn’t done so well during my last pregnancy/birth and helped me plan and prep a lot better. I was much more relaxed during his birth and the entire thing took about 20 minutes. I was up and running right after he was born! To be honest I felt great. My husband and I to this day talk about how differences the experiences were. It was like night and day. 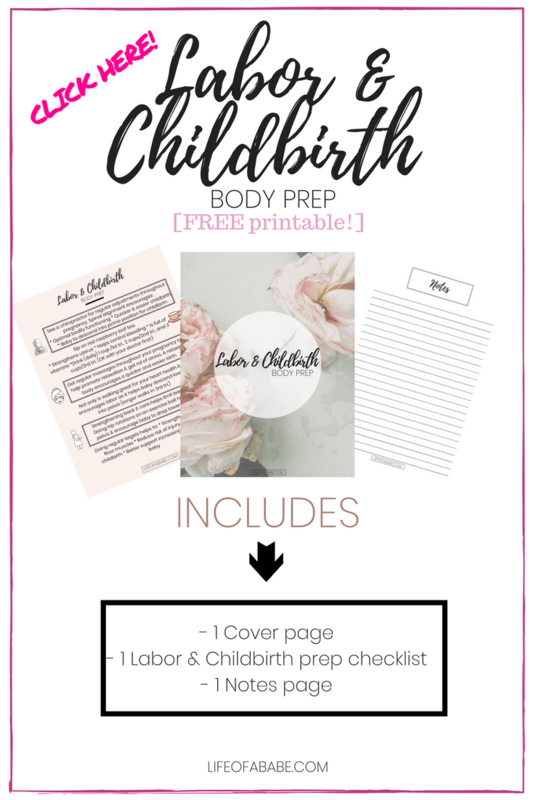 So I want to share these 7 things you should do to prepare your body for an easy labor with you mamas so that you can be on your way to having the natural birth of your dreams! Seeing a Chiropractor during my pregnancy saved my life. I started experiencing pelvic pain when I was pregnant with my daughter. The pain got progressively worse as I got bigger. It hurt to walk, to sit, to lift my legs when I put my pants on, it hurt to roll around in bed, it hurt anytime I made a sudden movement. It literally felt Like the lower half of my body was breaking in half right at the crotch. I started doing some research and was eventually referred to a Chiropractor by my then OB. A couple of adjustments later (realigning of pelvis and spine manually), I felt a lot better. Dr. Amanda over at the Bayview Village Wellness Centre did a very detailed analysis of my entire body and came up with a plan that was tailored to my specific needs. Here’s my baby boy getting adjusted by our favorite Chiropractor, Dr. Amanda. Unless you really suffer from pelvic pain throughout your pregnancy, chances are you’re never going to know how important having a balanced pelvis really is. If you look up pelvic pain, you will most likely see the terms Pelvic Girdle Pain (PGP) and Symphysis Pubis Dysfunction (SPD). These terms are used interchangeably because they are both associated with pelvic pain but they are said to be the same thing. – Take a curcumin supplement (this powerful herbal supplement helps tremendously with inflammation that caused by irritation and inflammation of pelvic joints. – Take an omega-3 supplement– This also really helps a great deal with inflammation. It’s the same exact one that we all use in my house. I get this supplement right from my Chiropractor’s office. Even my mother takes it. Nothing but great results from it! – If you work and are sitting most of the time, put in a workplace accommodation request and get an ergonomic chair. – You know what’s even better than an ergonomic chair? An exercise ball. Seriously, if your workplace can allow it, get one instead! Take it from me, if you leave it untreated, you can very well have your baby and still suffer from the pain months after. This is what happened to me and it has only recently gotten better. Mind you, my 2nd child is nearly 11 months old! Don’t neglect this pain. A misaligned pelvis can keep the baby up high and prevent it from descending lower into the pelvis. This, of course, will prolong labor, and can even lead to a c-section. It is common in pregnancy to suffer from SPD/PGP, but it is not normal so don’t allow yourself to suffer unnecessarily. RRLT is great uterine toner that helps prep your uterus for labor. It DOES NOT trigger labor. It only tones the uterus and helps it get stronger so it contracts more efficiently during labor. Stronger uterus=more efficient contractions=easy labor! RRLT often times get confused with raspberry tea but mamas, read the label make sure you get RRLT! This amazing herb also helps control bleeding postpartum. The one I’m recommending here is the same exact one that I took. I drank it throughout both my pregnancies (from start to end) and increased how much I drank as I got further along. Most women drink 1 cup per day per trimester, however, please check with your healthcare provider! Straddle an exercise ball and bounce on it. It’ll encourage your baby to get nice and low and to take the pressure off of your joints. Doing this as well as small hip rotation helps encourage baby to get in an optimal position for childbirth. If you suffer from pelvic pain (SPD/PGP) you can still do this. Just open up your legs a little less than shoulder with apart. You don’t want to worsen your pelvic pain. Walking is great for your overall health but in pregnancy, it is especially good for encouraging labor. During my 2nd pregnancy, I was diagnosed with a short cervix and was advised by my midwife and OB to avoid long walks as the pressure from the baby head on my cervix could trigger labor prematurely. So just from that alone, you can see the big impact walking can have on your body. When you reach the last couple of weeks 37.5+weeks, taking long walks can be good to help baby descend lower into your pelvis. Do you want a quick and easy labor? Do you want to minimize the risk of medical intervention? Then you need to get a proper prenatal massage! Not throwing any shade at your honey but a licensed Massage Therapist can really get the kinks out of all the nooks and crannies. My husband’s massages were only good for so long. Lol. Being relaxed is one of the keys to having a smooth labor and childbirth. Stress causes muscles to tense up in defense. There are many connective tissues and muscles that connect the top half and your body to your lower half. These all react to stress by tensing up and the result is you suffering from back pain, pelvic pain, and even constipation! You want your entire body to be as relaxed as possible so that your baby has enough space and flexibility to descend when the time comes. 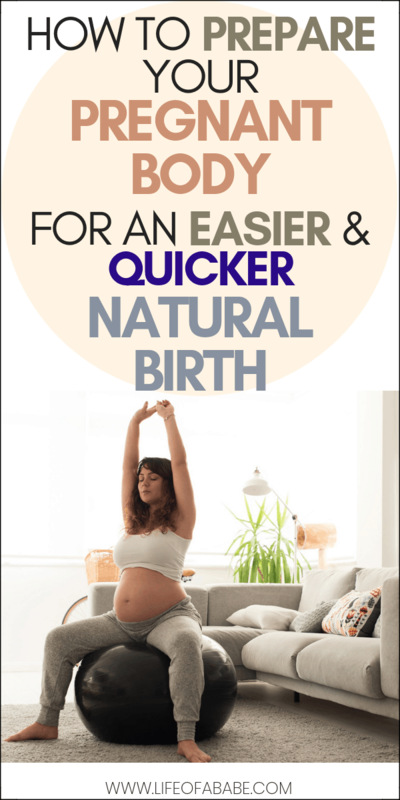 Check out this awesome post featuring 7 easy exercises for an optimal pregnancy and labor by NaturalMama. I did a lot of # 1, 2, and 4. Cow tilts are AMAZING. They really help loosen up your lower back and pelvis which is AWESOME especially when your lower back is constantly aching. My Chiropractor recommended these to me and I still do them even now when if feel like I needed so loosening up! Kegels help strengthen your pelvic floor muscles. Having a weak pelvic floor can cause a variety of disorders from loss of bladder control, to pelvic organ prolapse begin to droop (for more info check out this source). As your baby gains weight, more pressure is added on to your pelvic floor muscles. This is why so many pregnant mamas sometimes leak urine occasionally. Strengthening your PFM by doing Kegels is not only easy, it’s discreet (plus you won’t get all icky and sweaty!). You can do them while standing or sitting, at work or at home. The same way you’d hold back the flow of urine is the same you’d perform a Kegel (don’t do them while you’re actually peeing). You can check out this video for more detailed instructions. I know that every birth is different and that unforeseen events can happen but being prepared is never a bad thing. 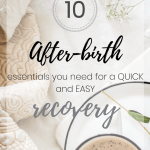 I hope you found these 7 tips on to to prep your body for an easy labor to be helpful and simple enough for you to get done before the arrival of your baby!! I created The M.O.M Natural Birth Prep to equip you with knowledge, practical tips, and motivation that will help empower you to have the natural birth of your dreams! In celebration of this, I am hosting a FREE giveaway! Simply subscribe to my email list and drop ONE comment on this post and let me know why you should win this awesome bundle! This is a good post for expectant mothers. When I was pregnant the first time, I take long walks, stay fit and get some exercises. However, my cervix won’t open even if my contractions are frequent. So, ended up in CS. Thank you so much for sharing, these are awesome tips! I am 25 weeks pregnant and trying for a VBAC after a somewhat traumatic first birth experience. I’ve realized during this pregnancy that I never dealt with my emotions from my first birth and I am doing everything I can to make this journey a natural and healing experience! I would love to win this package to expand my wealth of knowledge and resources going in to the birth of my second child. I am loving all of your articles! Thank you! Oh boy I would SO love to win the giveaway as a first time mom I’ve done my very best to prep for the arrival of our little boy but I would be lying if I said I’ve felt unprepared lately! Currently 35 weeks and knowing I don’t have a lot of time left to prep. Even these tips are so helpful so thank you!! Thanks dear ,this is quite a good one l know it will go a long way to help me.Thank God I saw and read it at the right time. I really appreciate your good work. My daughter is in Boston, she is due July 23, 2018. Any hope she could find a midwife who will deliver at home or even a birthing center for her? Any resources to find a good one. Websites alone are not enough, recommendations are best. I actually live in Toronto so I know nothing of the Boston area however you can always look online. Any experienced midwife should have good references! Wishing you and your daughter the best.